SALT LAKE CITY, Utah – HARMAN’s DigiTech announced today that e-pedals offered through the DigiTech Stomp Shop™ are available for free download for a limited time. Offering almost limitless sonic possibilities, the iStomp connects to an iPod Touch®, iPhone®, or iPad® enabling musicians to load the effect of their choice into the iStomp. “When we introduced the iStomp we changed the way guitarists think about how they go about creating their tone. By giving iStomp owners the capability to download any of the e-pedals available we are providing an unbelievable opportunity to immediately access a wide range of effects at no cost whatsoever!” stated Scott Klimt, marketing manager, DigiTech. The limited time promotion includes all e-pedals with the exception of the Adrian Belew Impossible Pedal. 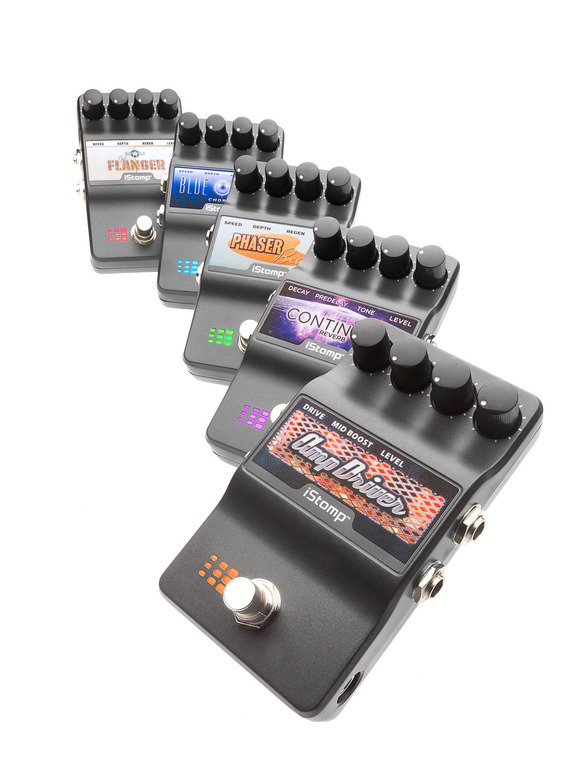 E-pedals currently available through the Stomp Shop include exclusive pedals from DigiTech, officially licensed pedals from other manufacturers and classic legacy DigiTech and DOD products. The iStomp pedal connects to an Apple iOS device using the DigiTech Smart Cable that comes with the iStomp. The iStomp pedal has four knobs to control effects parameters, which change their function according to which effect is loaded. iStomp makes trying out new sounds easier than ever. Instead of having to go to a music store or look for online demos that might have been done with unfamiliar gear, a guitarist can now download any pedal in the iStomp online store for free for use with their own guitar and amp. The iStomp comes with an iOS authorization cable and power supply.